In many ways September is the beginning of the New Year. The crisp nights foretell Autumn, though the days are still hot after the dew burns off. Summer holidays end and classes begin, marking a return to predictable schedules. Classes will resume at Rose Window Stained Glass too, which led me to revisit my own first stained glass class in 1994. A mom with 3 young kids, my career in the graphics/printing industry had just been eliminated by computers. I knew I wanted to use my ability to draw. 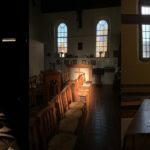 At a Quaker Meeting one Sunday morning I was entranced by the light cast on the floor through the 1860s clear glass. Its undulating dance struck me profoundly. I understood like an epiphany that glass is like people. We all have unique Light inside us that, when expressed, enriches everyone’s experience. 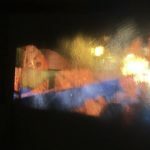 Light moving through glass took on a metaphoric spiritual significance that has guided me for decades. I signed up for a beginner class at Sunrise Stained Glass in which everyone made a hummingbird the first night. I remember how challenging it was to cut out those 7 little pieces! 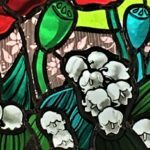 I gave the hummingbird to my mother, who especially loved the cranberry stained glass throat – she had expensive taste, as anyone who has ever purchased that glass knows! It’s made with real gold, did you know? 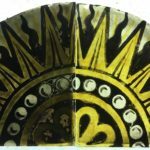 As an Artist and Designer, I design my own patterns. Here is one of the first. 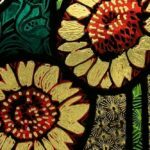 You may wonder if it’s ok to copy stained glass from the internet, and the answer is typically no, unless you have permission. There are lots of free patterns available, and some for sale. 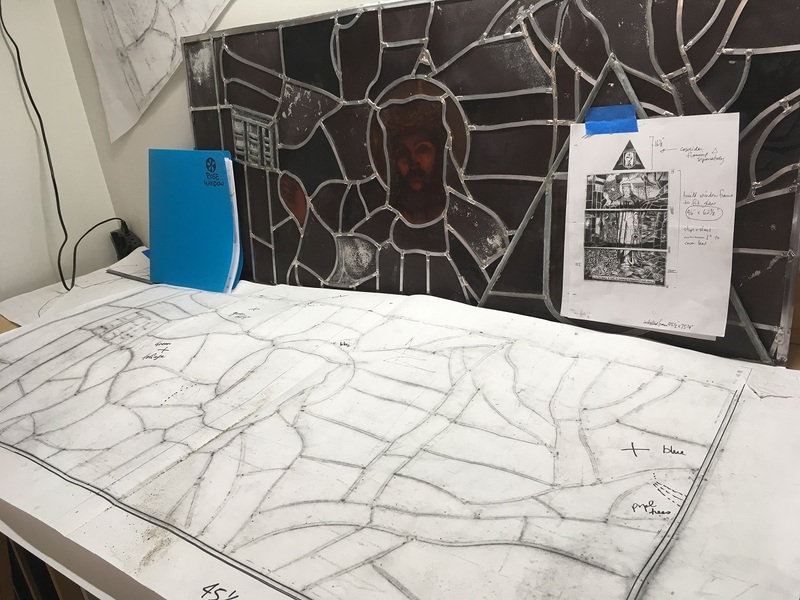 At Rose Window Stained Glass, students are encouraged to work from public domain patterns, stained glass patterns available in studio, or design their own with guidance. Click HERE to Contact, Inquire, or join the Mailing List! Lynette Richards participated in the Craft Nova Scotia (formerly NSDCC) Summer Show in Victoria Park and the Peggy’s Cove Studio Tour. Thank you to all the visitors who came and brightened my time!! 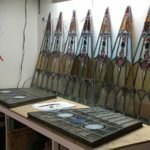 Rose Window Stained Glass has been busy caring for our heritage stained glass! 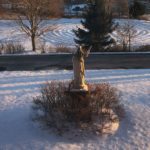 Call for inspection and estimates. Christ Knocking is a familiar image, originally a painting by William Holman Hunt, also called the Light of the World. This is the most reproduced new world image requested by churches. This version required full restoration of all panels, and reproduction of some painted pieces, to replace smashed glass and fragile lead came. 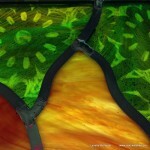 The picture below is shown before puttying, which darkens the lead and makes the stained glass waterproof and air tight. 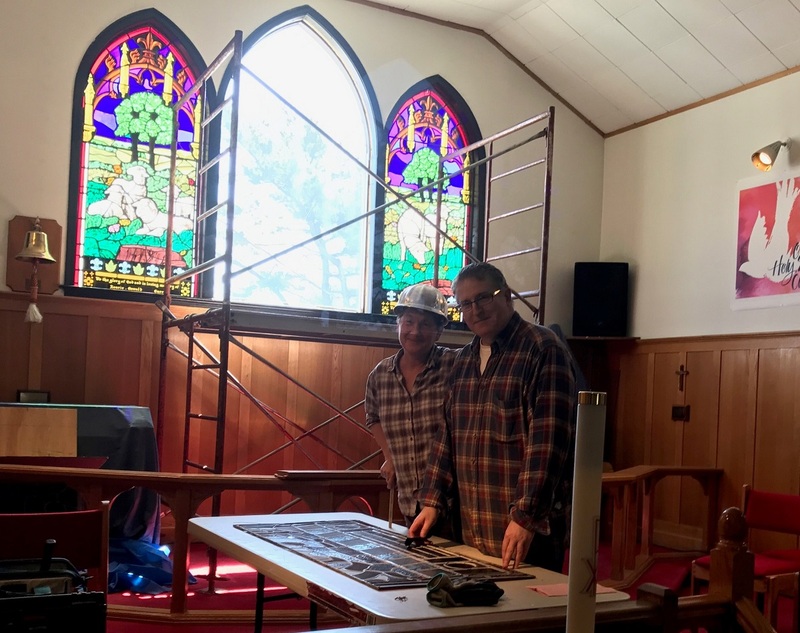 Philip Doucette and Lynette Richards have removed, repaired and reinstalled stained glass in several churches this season! Philip let me wear his vintage hardhat in this photo! 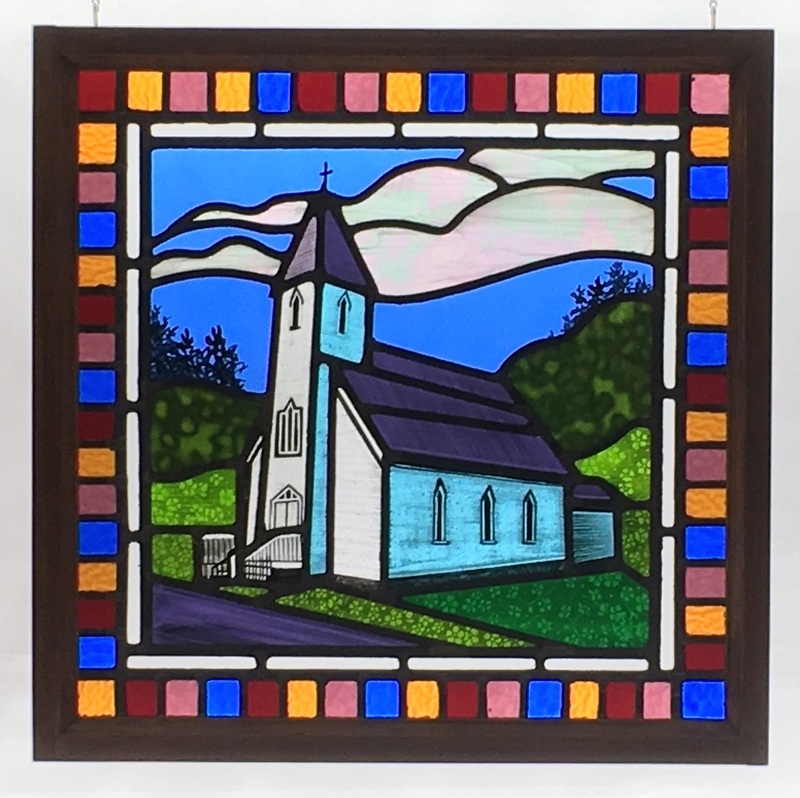 When this church was sold, the new owner commissioned me to create a commemorative stained glass window of it to hang inside the renovated church, now cottage, forever. 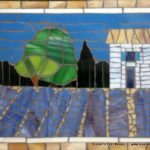 A local artist, Kathy Kaulbach, asked if she could hire me to instruct her to adapt her (already formidable) skills to glass to make a wedding gift! She spent a dozen hours in studio with me and created a wonderful painted fused glass gift. 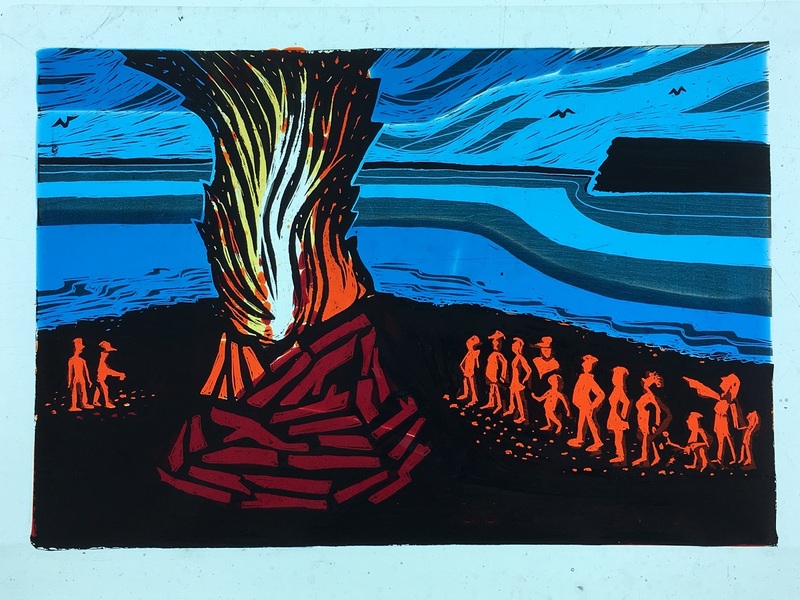 It recalls bonfires on Parrsboro Beach. 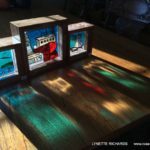 She mounted the finished fused glass to a hardwood base. What a special gift!